Light and flavorful quinoa salad with mango, edamame, bell pepper, flaked coconut, roasted almonds, and basil. This super nutritious salad is perfect for summer picnics and barbecues! This post is Sponsored by Bob’s Red Mill. Check out more delicious healthy recipes, snag coupons and find stores near you at BobsRedMill.com! Quinoa and I have been getting along famously lately. I have a tendency to set my sights on a specific food and let that flame just.rage, only coming up for air once I’ve sufficiently quenched that particular thirst. Lately, I’ve been on a quinoa kick, as I’ve been incorporating it into my daily lunch or dinner salad as a trusted source for carbs. There are few carbs my digestive system enjoys processing, you see, so once I find one that works for my body, I get a little elated. 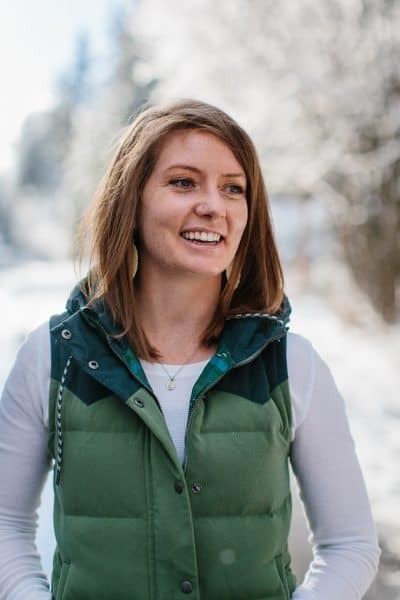 I keep my diet fairly low-carb for health reasons (read more about that here), and my body is very picky about its preferred source of carbs. As it turns out, I process quinoa famously, which is great news because it’s one of those highly nutritious whole foods that’s super easy to incorporate into my daily life. 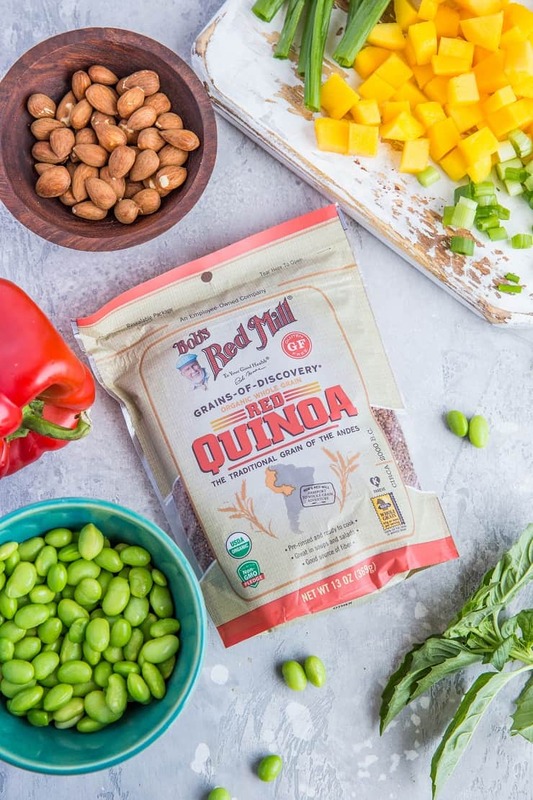 Let’s talk about quinoa for a second because it’s one of those foods that still generates a bit of confusion. Quinoa can be prepared and utilized very similarly to grains, although it has very different nutrient properties from grains. You may have read quinoa is actually a seed, not a grain. I’ve read both accounts, and it seems like the jury is still out. Truthfully, it doesn’t matter to me whether quinoa is a seed or a grain…what matters to me is its nutrient profile. Quinoa contains all nine amino acids, making it a good source for complete plant-based protein. One cup of cooked quinoa contains 8 grams of protein. I typically pair it with other protein-containing foods like nuts, seeds, or organic edamame for an even bigger boost of protein and healthy fat. 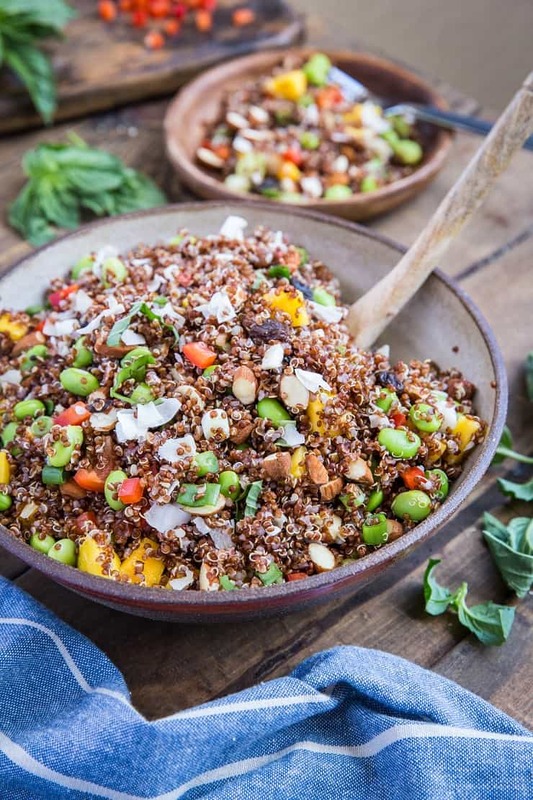 In addition to protein, quinoa is a great source of manganese, magnesium, iron, folate, B vitamins, and antioxidants, which give it a natural anti-inflammatory property. It is also lower on the glycemic index than grains. All in all, quinoa is a better source of protein and nutrients than grains while also being lower in carbohydrates gram-for-gram. 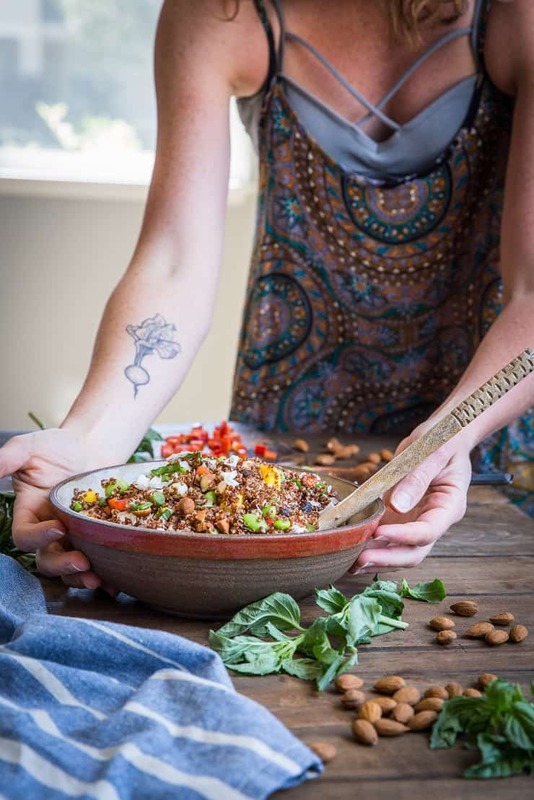 Quinoa does contain 39 grams of carbs per one cup cooked, so it’s not necessarily a good option for those following a super low-carb diet, unless you’re selecting it as one of your only carb sources for the day. 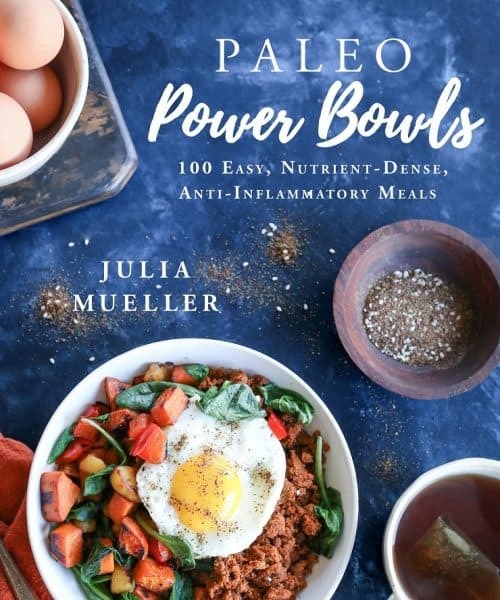 Some paleo people say quinoa is totally fine for incorporating into your diet since it isn’t inflammatory the way other grains are, although some give it the NO due to its carb content. It’s really a matter of who you ask. That being said, for someone like me who takes in all of her carbs through vegetables, nuts and seeds (versus grains, tubers, sugar, and fruit), quinoa is an excellent option. I have a difficult time digesting most grains, but I have found quinoa to be easier on my digestive system than all gluten-containing grains and even rice and oats. It is also a great option for those who are cognizant of their protein intake but don’t want to source all of their protein from animals. 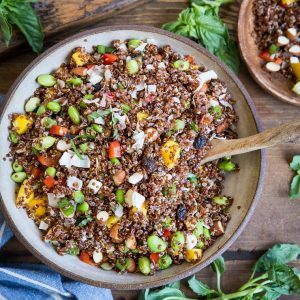 I used Bob’s Red Mill’s Organic Red Quinoa for this recipe, along with roasted almonds, fresh mango, edamame, green onion, flaked coconut, red bell pepper, raisins, and fresh basil. 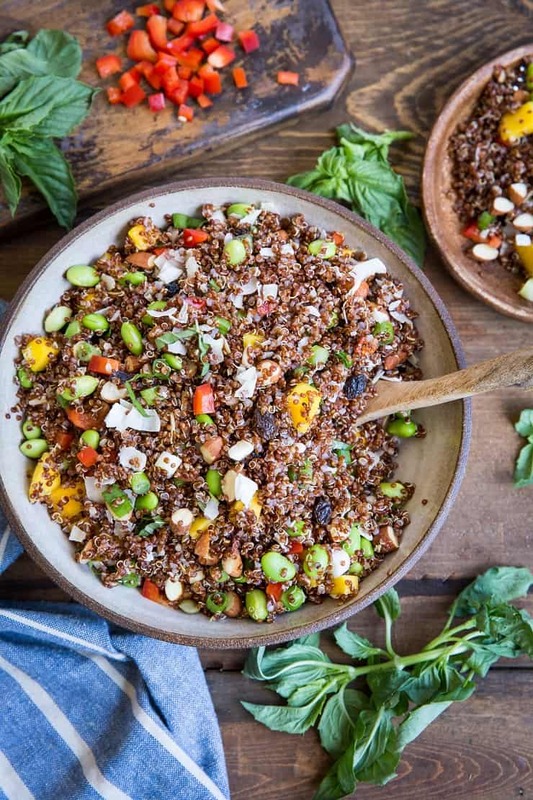 The combination of all the ingredients makes for a flavorful quinoa salad. I don’t use a dressing for this quinoa salad because I don’t think it needs it; however, if you like your salads to be vinegary or tangy, you can easily whip up a simple avocado oil (or olive oil) and cider vinegar (or lemon juice) dressing to mix into the salad for added flavor. While I’ve been known to eat this salad as-is, most of the time I put it on top of a bed of spinach, add some avocado, animal protein to make it a complete meal. I’ve been also incorporating the Mayo-Free Mango Avocado Chicken Salad I posted last week to make one big salad fest. I simply add the quinoa salad and chicken salad to a bowl of spinach and mix it all up with a drizzle of avocado oil and lemon juice. The concept is similar to that Crunchy Quinoa Broccoli Spinach Salad I posted a few months ago. I find adding this quinoa salad to my daily green salad makes my veggie intake so much more interesting. I’m a huge fan of texture, nutty flavor and crunch in my spinach salads, so this quinoa salad is perfect for adding that filling and palate-pleasing element. All that said, you can 200% eat this quinoa salad just as it is as a snack or side dish to your main entree. I personally don’t choose to eat it by itself as a full meal, but you can certainly do so if your heart desires! Feel free to replace the edamame with black beans, chickpeas, or kidney beans. Go bean-less to make this recipe paleo. Whisk together 3 tablespoons of olive oil with 3 tablespoons lemon juice and use as dressing for more flavor. Ain’t no party like a quinoa party!! Prepare quinoa according to package instructions. Allow quinoa to cool completely. Add all ingredients for the quinoa salad to a mixing bowl and toss to combine. Sprinkle in sea salt to taste. Taste the salad for flavor and if desired, add some olive oil and lemon juice to boost the flavor. Serve alongside your favorite main entree or add to a green salad. Love the variety of taste, texture, and color in this salad!! Perfect for meal prep for lunches throughout the week! Wahoo! All the variety and texture! What a beautiful variety of colors, textures and flavor! I’ve also found that I digest quinoa well so I’m making it a lot more now. This salad is on my list to make! It is very useful how you have some notes about replacement of severas ingredients! I wish every recipe has them. Thank you for sharing the article. I’ll make it this week with no doubt. I just but a los of mangos. Greetings from Panamá. Just whipped this up with a few changes: I used shredded carrot instead of bell pepper (no bell pepper in the house today), chopped apricots instead of raisins, and I added 3 Tbsp toasted sesame oil, 2 Tbsp apple cider vinegar, and a splash of soy sauce – soooo good! Thanks!